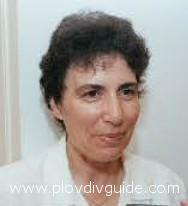 Nonka Matova was born on October 20th, 1954 in Plovdiv. Master of sports of gun shooting. Many-time Balkan and republican record winner in gun shooting. She has won the best gun shooter on the Balkans prize, as well as the Most Precise Shooter of the World prize - 1985. She took part in the several consecutive Olympic Games: Montreal 1976, Moscow 1980, Moscows Good Will Games 1984 (analogy of the Olympic Games in LA, 1984), Seoul 1988, Barcelona 1992, Atlanta 1996, Sidney 2000. Nonka Matova became Olympic Vice Champion from Barcelona, 1992; Champion from Moscow Good Will Games 1984; 28 times a European Champion, with two gold medals in male competiiton - Lvov, USSR, 1979; Champion in male competiton from the USSR Spartakiada Games, 1979.